バグ報告 - Welcome to TVPaint Community forums ! It has been a long time since the "Mirage" software days ! I hope you are fine. You are very welcome in the japanese forum. The bug has been found and we will try to fix it in the next coming update. Please be patient. Last edited by ten_zero on 05 Jul 2010, 09:38, edited 1 time in total. My work was helped by TVP always . and then I have had some requests and ideas at work . I will write here those . but I`m not good at English . so I`m going to write in Japanese here. sorry, and thanks to ten_zero san . I'm challanging to translate Taku's Question and report simply. SAI is very popular in Japanese young illustrators. because, it is easy to draw at a low price and simply. SAI is used by many users , it is next to PhotoShop in this questionnaire investigation . This "Watercolor brush" of SAI feel is very good . this brush works as blur brush in low pressure . in high pressure , it works as clolr brush. 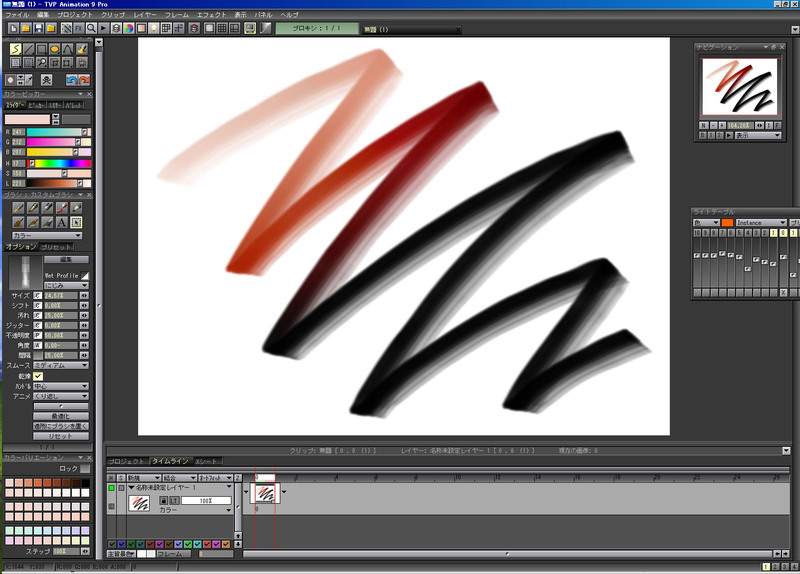 I have problem when I import a 256 gray scale PSD docment on TVPaint project, the docment color converted to Red and Black. Is that a bug ? In Japan, a Line art docment made in 256 glay scale or 1bit (black or white) color mode. This problem had Corel Painter, too (〜version X.1, latest version 11 is fixed). I have two requests for brush function, Tool→CustomBrush→Smear stamp. When I'm peinting in one stroke, A-color change dark by dark ( from high chroma to a low chroma ). I feel it too tricky to use paint uniform quality. The function is good, however too much blend. I expect for にじみ、change blend color from mixed color to set A-color. In Corel Painter, the function call "Well"
and Almost Japanese Paint soft call "混ぜ塗り/Maze-Nuri（article in Japanese）". The beginning it mix painted color, but return gradually to original brush color in one stroke. These struck me as incongruous. ※ I think It's caused by culture gap "にじみ/Nijimi" means. TVPaint and other over sea paint soft, "にじみ" is Smear (in french, baver) or compound color. but in Japanese paint soft, "にじみ" means blurred blend on watercolor paint. I can not make a sample file by "paint tool SAI", because of it for only Windows OS, not Mac. I have ask more question and requests, so till next time, I get my ideas in shape. "I have problem when I import a 256 gray scale PSD docment on TVPaint project, the docment color converted to Red and Black. Is that a bug ? " and to Apply the FXstack on each layer. (to see the "before/after" animated gif example, click on it). Please can you post a .psd file in the forum, so we will take a look and rectify the bug ? I made .psd files and Up load to here . The transparency area of the layer makes trouble. Only the layer in the right under reddens. OK, the bug should be fixed in the next update.